The tenrec is a small placental mammal that is native to Madagascar and western Central Africa. Tenrecs tend to be omnivorous. They mostly eat invertebrates, mainly insects and worms. Some tenrecs have tails and some do not. Tenrecs range from about 1 inch to about 15 inches long, excluding any tail. They are usually brown on top and lighter on the bottom. 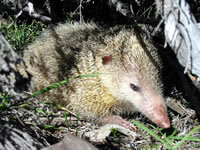 Most tenrecs are nocturnal (active at night). They live in a variety of environments. Some tenrecs are arboreal (live in trees). Others live underground or in the water. Unlike most placental mammals, the tenrec has one opening, a cloaca, which it uses for all excretory and reproductive functions. Monotremes (egg-laying mammals), birds and reptiles have cloacas. Many tenrecs resemble hedgehogs and shrews. Madagascar, curl themselves into balls when they are threatened, like hedgehogs. Based on DNA evidence, scientists think that tenrecs and golden moles belong to the same order - Afrosoricida.